Domestic manufacturers’ desire to have more young people interested in applying for open positions within their ranks is no secret. The possibilities open to teenagers and 20-somethings in the U.S. manufacturing community are wide open, even if parents, guidance counselors, educators, and the young people themselves don’t immediately recognize it. The good news is that everyone is becoming more aware of the opportunities that await. In a 2017 survey on U.S. perception of the manufacturing industry, sponsored by Deloitte and The Manufacturing Institute, respondents overwhelmingly said they believe manufacturing is vital. More than eight in 10 of those surveyed indicated that the U.S. manufacturing industry is important in maintaining the “American way of life.” After several years of watching a shrinking manufacturing base battle against global competition, people recognize that advanced technology is making U.S. manufacturing mighty again. That’s not everyone, however. For the most part, people with a connection to manufacturing know that these are the new glory days. In fact, the same U.S. perception survey reveals those with a high manufacturing familiarity are nearly twice as likely to encourage their children to pursue a manufacturing career than nonparents and those with low familiarity. Companies still have work to do in spreading the gospel about manufacturing if they want more young people to recognize them as an employer of choice instead of last resort. 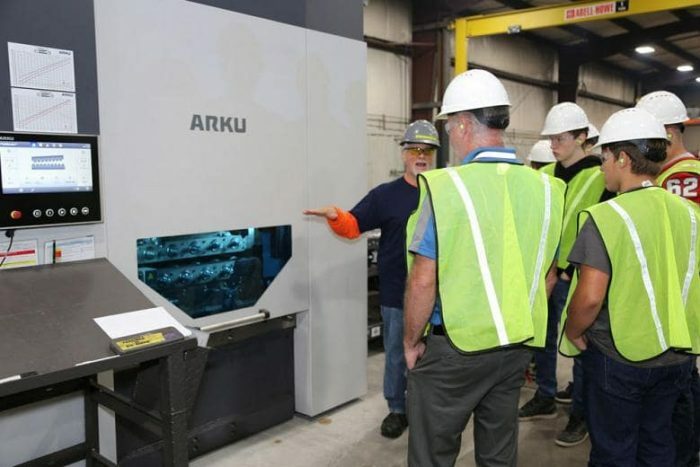 Miller Fabrication Solutions, Brookville, Pa., has gotten aggressive in reaching out to the next generation of manufacturers. The company has representatives who sit on several industry-related advisory councils and boards in the area, and it is a sponsor of robotics competitions in the region. It also has worked with nearby school districts to provide opportunities for students to learn about manufacturing. Miller has two facilities in Brookville, with just over 350 employees, and another shop in Homer City, Pa., where another 85 people are employed. 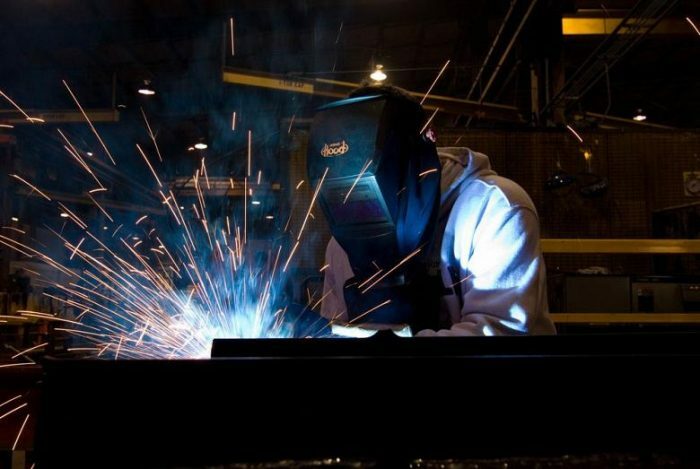 Miller Fabrication Solutions regularly hires seasoned welders, but for qualified candidates who lack welding certification and experience, the company uses an internal weld program to develop their welding skills. To learn more about what works for Miller as it recruits for open positions at its three facilities, The FABRICATOR spoke with Bonnie Frampton, human resources manager; Spencer Sturgeon, recruiter; and Susan Towers, marketing director. The FABRICATOR: What has Miller Fabrication Solutions done to position itself as an employer of choice for young people who might be considering a career in manufacturing? Bonnie Frampton: From a human resource perspective, we have to have a recruiting strategy because we are definitely growing, and as we’re growing we are looking to establish ways that we can spread the word about what Miller has to offer and what a career in manufacturing has to offer. I think young people today are not getting educated properly about what possible options are available. I don’t think that the educational system has done a good job with accurately providing a full list of all those options that are available to students today—especially students who are in high school or in tech school. I mean, college is great, and it’s one of many options that works well. But it’s not the only option or the best option for everyone who wants to have a successful career. For example, we recently started a weld program in-house last year. We now can hire students, recent grads, or anybody who has an interest in welding and then train them. We actually pay them to train to be a welder in our in-house program. This gives them the opportunity to get some work experience and learn a really valuable skill that’s in high demand right now. FAB: How long does that welding training last before enrollees are able to contribute on the shop floor in a positive way? Frampton: It’s an eight-week program for most people who participate in it. If people need a little bit longer, depending on their skill and experience level, we can extend it. But it’s a four-week training period where they’re over in a separate building that we use for the weld program, and they’re working with instructors and foremen. Then they have the final four weeks on the job where they weld and learn on-the-job skills for the department that we hope to place them in once they complete the program. Miller provides both public tours, such as those offered during Manufacturing Day 2018, and private tours for student groups, school administrators, and teachers as part of its overarching recruitment strategy. FAB: What are the best ways that you have found to connect with younger people and have them seriously consider a career in manufacturing? Frampton: We get them involved and get them engaged through more in-person interaction, like tours and on-the-job training. Also, co-ops and internships are really big. I think those activities will help to convince them to stay. A crucial piece of our campus recruiting strategy is taking into account that students today don’t want to learn in just one way. They’re not interested in just attending a lecture and having that be the standard way that they learn. They want to get involved. They want to have discussions. They want to get involved in competitions with each other. They want to tackle real-world problems. They want to understand where they fit into the company’s overall strategy. We try to offer a variety of those options in addition to the weld program, co-ops, and internships. Our recruiter, Spencer Sturgeon, is gearing up for spring campus recruiting, so he is working with probably six to eight local schools to make sure that he’s offering those opportunities to students. For many, that begins with a tour and trying to keep those as interactive as possible. FAB: Is reaching out to the local schools pretty much the job of one person at Miller, or is that shared with people actually involved with the metal fabricating work? Spencer Sturgeon: I’m not the only one that’s going to be involved with that. We have other people who go out to these events, such as the robotics competition that Penn State-DuBois holds every year. We like our people to act as sponsors for these types of events. We also like to try and have a member of our company be on the board of the local Triangle Tech. Along those lines, I just had a technical school in Indiana, Pa., reach out to me about attending meetings so that they can hear what we think they need to do to train students for the future. Susan Towers: I will add that this also involves our chairman of the board, Dave Miller. He has shown interest in the company being involved with these robotic competitions and other competitions such as What’s Cool About Manufacturing? competitions [www.whatssocool.org]. It’s not uncommon to see him at an award presentation or interacting with kids on the shop floor. FAB: What benefits has Miller gained as a result of this type of community outreach? Frampton: What I can say is that these activities are taking place at the same time that recent graduates are finding more uncertainty as they enter the job market. They wonder how they are going to find their first job and how they are going to make sure that they’ll like it. There are so many factors that are becoming more and more important to them. They are worried about getting along with the boss, communication styles, benefits, and work-life balance. There are so many questions that they have, and sometimes the traditional interview process, which is typically a little bit more formal, doesn’t always adequately address those questions. Offering more tours, more co-op and internship options, and other ways for them to interact with real manufacturing professionals gives these young people an idea of what a day in the life of a manufacturer is, whether they want to be a machinist, a welder, an engineer, or anything else. 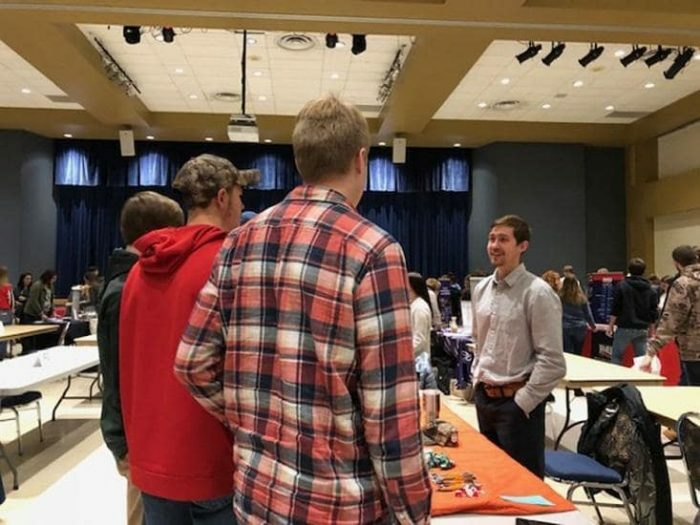 Recruiter Spencer Sturgeon meets with students at Clarion University of Pennsylvania to discuss career and advancement opportunities with Miller. To help better figure out their interests, we like to offer a really rigorous, comprehensive interview process that starts before they’ve even applied. We are trying to really push these informal opportunities, where these young people can start to develop relationships with our representatives in the community and have conversations about manufacturing and opportunities with Miller, without having to put on a suit. Those young people can then polish up their resumes and come in for a formal interview. That’s when you can more formally talk about what welders do or the growth opportunities at Miller. Maybe they are concerned about trying something and finding out it’s not for them; we can talk about other options. We love to provide these opportunities because in my mind it’s just a win-win for both of us. They get a chance to try out a job, and we get a chance to see how interested they are and what they’re willing to try and how willing they are to learn. Sturgeon: Just the other day we had two high school student welders come in and job shadow our welders. I also gave them a tour of the place and talked about the kind of career progression that can occur at a place like this. Maybe they want to come in as a welder and later realize it’s not what they want to do, so they move into a quality technician role or try machining instead. Those are the different kinds of paths that they can take at a place like Miller. Towers: There’s also a promotional aspect to this effort as well. Certainly the recruiting outreach is a huge component of this strategy, but our marketing also plays an important part. Marketing and human resources are highly collaborative, and we want to make sure that we have a consistent promotional strategy. That involves everything from social media to digital ads to local TV and radio advertising. So it’s fairly comprehensive. FAB: Do you think that Miller is getting a better job candidate as a result of these efforts than it would be getting if these efforts weren’t taking place? Frampton: We are definitely focusing on quality candidates more so than just trying to get people in the door. We want people to not only come onboard with us, but also meet us halfway when we offer all of these learning opportunities. We want people who are going to work with us to figure out what they’re really passionate about and channel that into one of 90 different jobs here. There’s no shortage of variety, and that’s really what a lot of young people are looking for today. We just try to get that message out there and in multiple ways. Then we see who’s a good fit, who wants to come on board, and who wants to grow with us. Towers: Our company has done a really good job of refining our qualification standards as well. We’re not just opening the door and saying everybody come on in. We really want to understand who fits within our core values and who fits within the roles and responsibilities that we have available. FAB: How long has it taken Miller to create the infrastructure to have such community outreach, create co-op and internship opportunities, formalize job descriptions, and chart out career paths? Towers: First, I’d say that it’s still very much a work-in-process. Frampton: I would agree with that. I started with the company about a year ago, and that was the first priority from the get-go. We wanted to make sure that we were providing those opportunities to people because it’s certainly been proven out over the years with multiple examples of people having fulfilling careers as the company has grown over the last 50 years. For example, a former janitor is now our head of quality. He’s a really sharp guy. We gave him that opportunity when he started and that was about 30 years ago. In another example, one of our machinists is now our director of lean manufacturing and business processes. He’s now touring the country, learning everything he can about lean manufacturing to implement within Miller as we grow. So there’s no lack of examples. As we continue to add head count and grow, we’re really focusing on building a methodology and building in some processes and procedures that make it easier and quicker for people to come onboard. We want them to see the variety of options that are available and then know what to expect if they want to go down one of those roads. FAB: With this type of outreach, do you think Miller is influencing some of the influencers, such as educators and guidance counselors, helping them to recognize that manufacturing careers today are not like the ones of yesteryear? I think this is really going to pay off whenever more of these kids start to graduate from high school and they have to start looking for jobs. We’re going to be seeing a big influx of qualified candidates in the future. FAB: What are the reactions of the young people that you are reaching out to once they’ve seen a modern metal fabricating operation? Sturgeon: I think it really opens their eyes because I can give them a great example of an employer that is ready to hire people. The young people think that the trades are dying. Schools aren’t pushing them that much. Well, I remind them that I went to college for four years, paid a lot of money, and now I’m in debt. These students are going to come out of tech school with a great skill that the manufacturers need right now, and they’re going to be making a lot of money. You don’t necessarily need to go on to a four-year college to be successful. And I think that reality really opens up their eyes. FAB: Of the young people who visit Miller, what percentage of them do you think are seeing a metal fabrication company for the first time in their lives? Frampton: That definitely is true. I just don’t think that there’s been much coordination between the manufacturers who are here and the local educational system until very recently. That’s another huge focus for us—arranging for field trips for local high schoolers and college students to see our facilities. FAB: Are there any areas where Miller can do better in connecting with young people and letting them know about possible manufacturing career paths? Frampton: There’s always something we can do. It’s a central part of our mission statement to continuously improve. Whenever Spencer and I run our new hire orientation program on Monday mornings, we always say continuous improvement is an essential part of the way that we do things every day. There are plenty of really exciting initiatives that we’re hoping to work on in the next couple of years. Looking back at the road to how we’ve gotten to this point, we’ve added a lot of user-friendly ways for people to learn more about what we do. We also have done a tremendous amount of work around our digital recruiting and our advertising efforts. We are trying to really target and reach the people that we need in the next couple of years. Dave Miller and I were having a conversation recently about how some of the local schools are starting to implement programs to arrange for job shadowing for students. It’s not just for a couple of students who are the most enthusiastic about manufacturing, but rather a bigger part of the student population that can do one of these one-day job shadowing opportunities. For example, if we have 90 different job titles, we have 90 different opportunities for job shadowing. Once we can more closely partner with local schools, maybe we can find people not only interested in manufacturing, but also accounting, marketing, engineering, or quality. We also want to be able to add more free in-house training. That way it’s easy, convenient, and relevant to the job these people might have or be interested in. It’s just an added perk for the employees. We already have a broad array of training that we are currently offering, and we want to implement even more. Towers: All of that is crucial in developing the overall employee experience here at Miller, and we’re always looking at it from the user perspective to see how we can make things a bit more user-friendly for employees to learn about what’s available for them. So we have an internal app where employees can find information about benefits, events, and other things going on within the company. It’s a wonderful portal and a useful tool that has the potential to expand employees’ insights into their career paths within Miller. 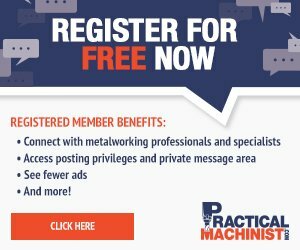 FAB: What advice do you have for metal fabricators that are just starting their recruitment efforts to reach out to young people? Frampton: I would say figure out how to create those win-wins on a person-by-person basis. That’s something that has worked very well for us consistently throughout Miller history. Right before you start thinking, “Oh, I need to implement some huge formal program,” just start having those discussions. If you’re a manager, make sure that you know the career goals or the personal development plans for each and every one of your employees. If they don’t exist, just start with an easy discussion about it. What things might interest the employee? What things seem to get them excited? If the employee could get cross-trained as a backup for another position within the company, what job would they choose? Those types of topics can start the conversation.